Not surprisingly, this issue has been raised in the past in both Inside Higher Ed and the Chronicle of Higher Education. Just this week there was a CNBC guest blog and a Fox News Business article on related issues. I’m sure that this discussion has been held on campuses everywhere. I’ll tell you what I said. Are Students Charged More? Let’s Look at the Stats. We will soon release the results of the Managing Online Education Survey that we recently conducted in partnership with the Campus Computing Project. As background on current practice, here’s an advance look at the responses to a few questions related to this topic. There were 199 respondents to the survey representing all types of institutions and from throughout the country. Do students in you online program pay the same tuition for one term? Figure 1. Same Tuition: Online v. On-Campus? From the Managing Online Education national survey, slightly more than one-third of the respondents (see Figure 1) reported charging a tuition that differs from the amount charged to on-campus students. For the 72 institutions that did not charge the same amount, about one-fifth (19.3%) charged an amount that was less than charged on campus. I found the outliers particularly interesting. Charging $250 in additional tuition fits into stories that I’ve heard about select programs being able to charge premium pricing. Sometimes higher cost is equated with higher quality. One of the Indiana Master’s programs in question was charging a much higher fee because they were able to get the student’s employers to foot the bill. Charging $250 less in tuition surprised me and I’d like to learn more about how those institutions could do so. 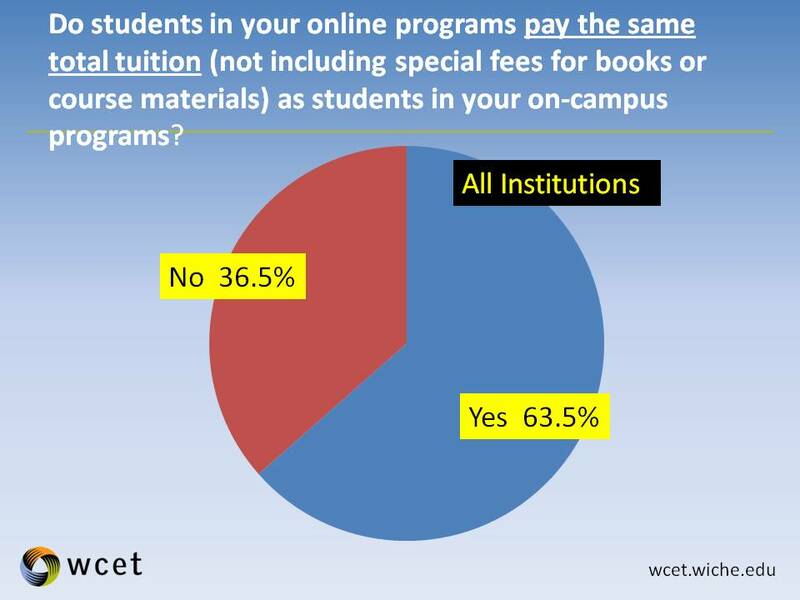 Do students in your online program incur special fees not charged to on-campus programs? 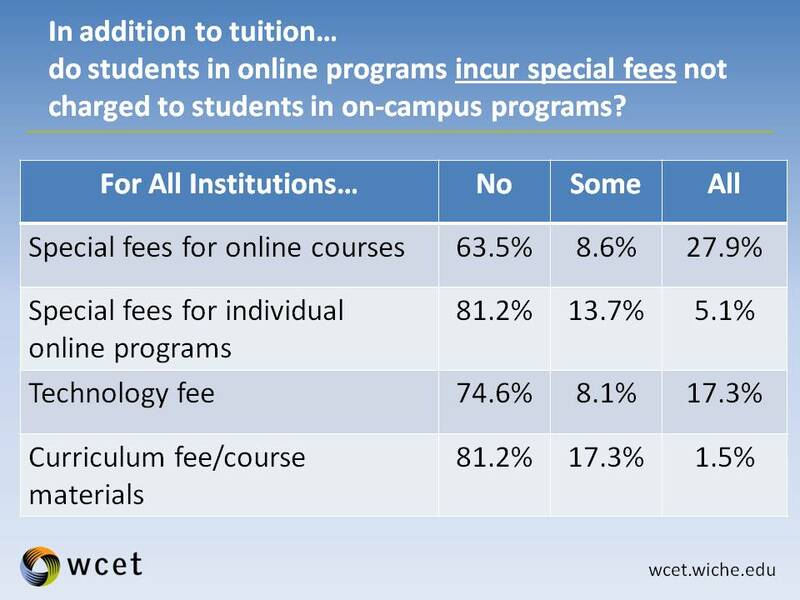 Figure 2: Special Fees for Online Students? We saw the majority of institutions charge the same tuition, but some add on extra fees. We asked about a variety of fees (see Figure 2) that could be charged by an institution. A “Some” response covers institutions where a fee might be charged in some of the college’s programs, but not all. For each type of fee, about one-fifth to two-fifths of institutions charge that fee. For future research, I would like to check the data on both the tuition and the fee questions. I am very curious to learn how many institutions actually charge more in overall price. Some institutions might put the extra cost in tuition and some in extra fees, depending on local rules and custom. About half charge more in tuition. What would that percentage increase when adding in those that charge extra fees? Sometimes people get confused over the concepts of cost and price in higher education. For the purposes of this discussion, let’s begin by defining some terms. “Cost” is the actual amount that an institution would need to spend to create, offer, and maintain the course. About a decade ago, the National Center for Higher Education Management Systems partnered with WCET to create the Technology Costing Methodology (TCM), which is a set of step-by-step procedures allowing institutions to analyze the costs of alternative modes of instruction. In working on TCM, it always amazed me how many institutions did not want to know their cost. For those who don’t know their costs, it makes it impossible to have cost-based pricing. Continuing education units tend to have a good handle on their costs, while I have observed that to be less true in the main part of campus. “Price” is the amount (tuition plus fees) that an institution charges a student to take that course. Price can be cost-based, as is often found in continuing education programs. It can be based on what they market can bear, as was demonstrated in the Master’s program referenced earlier. For many public institutions, the tuition component on price is based on a figure that is incrementally increased by a governing board. For public institutions, tuition often reflects what is politically feasible. There is a nod to costs, but not necessarily a real correlation. With the exception of the Master’s program that could charge what it pleased, all the other programs presented to the Indiana Commission used what appeared to be cost recovery or marginal-cost pricing model. Let’s begin with the cost to an institution for offering a traditional, face-to-face course. The major cost for the course is the faculty person, who designs the course, does an instructional design (like making Powerpoints and handouts), teaches the course, tutors students, and performs the assessment. Now let’s have that the same faculty person teach an online course. If you begin with the assumption that the faculty person will perform all the same roles as the face-to-face class, you already have a base cost that is the same as for the face-to-face course. Add to that are the costs of technology, instructional design support, stipends for the faculty person to teach the course, student technology support, and payments back to the department. If you start with the same basic cost (the faculty person) and add more costs, the course simply must cost more. If you use the cost recovery model, then this added cost is reflected in the push for higher tuition or extra fees for online courses. But, is this the only model?? One of the major lessons from Technology Costing Methodology was summed up in the phrase, “it’s the people, stupid.” We found again and again that the greatest cost of a technology-mediated course is the amount of personnel (faculty, instructional designers, teaching assistants, etc.) incorporated into the course. In other industries, lower overall costs have been achieved by replacing labor with capital (see marginal rate of technical substitution) or by replacing more expensive labor with less expensive labor. And here’s where I will get people upset and where many leaders want to run away…to address the cost issue, you have to think about using people (especially faculty) differently than in the traditional, face-to-face classroom model. I am reminded of a meeting I had when I was in North Dakota when I coordinated the video conference network and distance education activities for the University System. At least once each year I would visit each campus to make sure that we were meeting their needs. During our first year, a faculty group at one of the campuses requested to meet with me about the emerging Interactive Video Network. My answer was: “It won’t.” I proceeded to explain how the mission of our distance education work was to expand access. The two largest universities are located within about a mile of the Minnesota border in a state that is about 350 miles wide. Additionally, other institutions had unique programs that could be made available to residents of a rural and sparsely populated state. My mission wasn’t about containing costs, but expanding access. This faculty person, Indiana Commission members, and many of the reporters in the articles cited above hold the assumption that just because technology is involved that costs (and ultimately price) should eventually be lower. It can happen, but it’s not automatic. In my experience, the only time when costs and price are lowered is when those reductions are an explicit goal. There are examples of this including the Open University of the United Kingdom, Rio Salado College and the work of the National Center for Academic Transformation. By the way, for those of you who are ready to shout “what about quality,” I think that these examples addressed maintaining a focus on quality. That is not always the case, as shown in the research cited in the Fox News Business article. Just because it is not always the case, it does not mean that it can’t be the case. My parting advice to Indiana’s Commissioners: Set a goal that you want specific programs that costs less, has a lower price, and maintains quality. Charge the institutions to return with a plan as to how they propose to meet that goal. Don’t micromanage. Lead. I was surprised when I found out that online classes were more expensive at the local community college. I was figuring we could save some money, but what a shock. I think that the problem may be that they are just putting the current class “online”, instead of thinking inside the online box. If they simply take a class that they offer in a traditional setting, and put it online, it will always be more expensive. But if they specifically design an online course, then it may not be. I would think that an online class would allow you to process more students, which would allow you to spread out any costs over a larger group of people. An online class could also be more automated somehow. That’s one of the key things about computers: they perform mundane tasks automatically, repeatedly. If all you are doing is giving students the ability to take the class without having to drive to the school, then yes, it would be more expensive. But if you automate enough of the class, it should be cheaper. If a professor records a lecture to video, he wouldn’t have to give that lecture again to every class. Instead of asking the professor a question directly, students could be required to search a knowledge base first for the answer. Online textbooks could be edited every year without the cost of printing and binding them. A college is a business. How does it make any sense to charge more for your product just because it is online? Imagine if WalMart charged and extra 15% for all their products on their website? Their website requires special staff, too. But it allows them to sell to more people without having more stores to maintain. And the online buying experience is better. You can find the product you want, know if it is in stock (v just not on the shelf), gives you detailed product information and customer reviews, etc. etc. You can search for similar products and compare them. It’s a better buying experience, for the same price. Russ, I’ve shared your post on Google+ at the link below. In addition to what Sandy Sener mentioned about facility costs in an earlier comment, I am wondering about any consideration of blended/hybrid courses. We have courses that are partially or mostly online, meeting face-to-face several times per term. Supposedly good for the students and a savings on classroom & infrastructure usage. I think one of your assumptions needs clarification. You say “The major cost for the course (a traditional, face-to-face course) is the faculty person…” and go on to say “If you start with the same basic cost (the faculty person) and add more costs, the course simply must cost more.” There are other costs to offering a face-to-face course, such as the classroom and facilities. Those costs should be less or non-existent for an online course. While I’m not saying the cost savings from not incurring those costs makes up for the additional costs of technology, I think they should at least be acknowledged in the equation. In other words, the real cost of an online course is Base Cost (faculty) + Technology Costs MINUS Facility Costs. Excellent commentary, Russ! I want to add one other important aspect of this issue which is routinely overlooked. You noted that the Commissioners wanted to know an answer to the question “If technology is bringing down costs in other industries, why isn’t that true in online education?” There is another answer: because education is a high-value, high ticket, nearly essential item. Technology has NOT brought down costs for other similar items such as housing, automobiles, or high-end health care, and for the same reason: because cost/price is only one of the factors in the value proposition, and usually not the most important one. Consider, for example, what happened when Volkswagen made the Jetta cheaper for the 2011 model year. Sales rose, but auto critics and aficionados derided the changes and declared the newer model to be inferior. Can you name a higher education institution that wants to be labeled inferior in the name of reduced cost? Instead, elite colleges use their surplus of applicants to enhance their selectivity and reputation; they don’t reduce costs by admitting more qualified applicants. Imagine if your typical university announced that it was reducing tuition by 10%: the most likely reaction would be, ‘what are they doing to make it worse?’ Or imagine if Gov. Perry had challenged the automakers to build a $10K car instead of a $10K college degree: the likely reaction from the public would be ‘I’m not gonna drive that deathtrap’ — and, of course, derision from the automakers themselves.